This is a personal account of my involvement, from 1961-1978, in the beginnings and the growth of the Soviet Jewry movement in America. This piece was prepared June 2007 for inclusion in A Cleveland Jewish History Reader by the Kent State University Press. To this purpose, the content was confined in scope mainly to a limited number of local activities and in size to about dozen and a half pages. For this special edition I have augmented the original text with supplemental material. It began innocently enough in a discussion group. In the fall of 1961, a few of us at Beth Israel-The West Temple, Cleveland, Ohio, formed a Social Action Committee. As chairman we selected Mort Epstein, a soft-spoken, deliberate individual, who headed a graphic design firm. Mort was recognized in the Cleveland community as a long-standing advocate for fair housing. Two others who sparked the group were Herb Caron and Dan Litt. Herb was an assistant professor of psychology at Western Reserve University and a researcher at Crile Hospital. Dan Litt, our rabbi, felt it important that the congregation reach out beyond the confines of Beth Israel, to the larger Jewish world. The remaining members were Don Bogart, a NASA nuclear physicist, a gentle man and ardent champion for social justice; Dave Gitlin, an allergist, an outspoken political activist, who took over the Committee chair in October 1962; and lastly, me, a 38 year-old NASA research manager and president of our small congregation. The Holocaust figured prominently in our studies and deliberations. Not surprisingly, we returned to it again and again; after all it was the central Jewish tragedy in our lives as teenagers or young adults. What particularly struck us was the poverty of response to the dire predicament of European Jews from the U.S. government and — most distressingly — from the American Jewish leadership. Chaim Greenberg, in his angry, anguished essay, Bankrupt, published in the February 1943 issue of the Yiddishe Kemfer, bares the sin of the Jewish leadership. He castigates them for continuing their “normal behavior of in-fighting and advantage-seeking,” one organization over the other, rather than unifying to create a political force to save a greater number of European Jews from the Nazis. By 1963, we concluded our studies of the Holocaust period. Clearly, the next question was, is there, nowadays, a major Jewish population at risk? That led us quickly to the plight of three million Soviet Jews, well over a quarter of world Jewry. Anti-Semitism was widespread in the Soviet Union, much of it promoted by the government. To boot, the government actively suppressed Jewish cultural and religious expression It was not much of a stretch to foresee — given the tragic fate of tens of millions of Soviet citizens during Stalin’s reign — two possible dire outcomes: denied cultural and religious opportunities, in a generation or two, Jews would disappear as a distinct people; or a campaign of anti-Semitic pogroms and forced resettlement to camps in Siberia would result in physical decimation and incalculable misery. 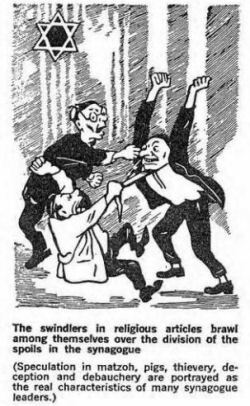 Jews in Eastern Europe, a quarterly published in London, England, beginning in 1962, provided detailed information about general anti-Semitic campaigns by the Soviet government. There were reproductions of Soviet cartoons that depicted Jews in like fashion to the Nazis. 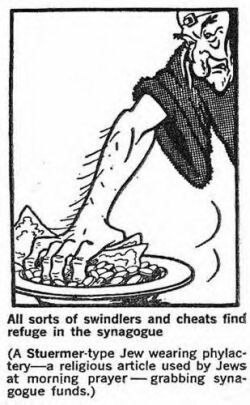 In many instances the Soviet authors merely lifted and recycled old Nazi cartoons, only changing the caption to suit Soviet purposes. Books and newspapers from Soviet publishing houses regularly characterized Jews as alien and inimical to Soviet society. Here was a major state blatantly peddling rank hatred. Additionally, there was cultural deprivation. From Stalin’s time on, the Jews were essentially denied access to Jewish culture, including religious expression. Jewish theaters, publications, newspapers were forbidden. And, the Jewish intelligentsia — a large and talented group of individuals — were effectively wiped out, executed or imprisoned by Stalin, between 1948 and 1952. In areas of large Jewish concentration, many synagogues were forcibly closed; the remaining few functioned under control of State-vetted officials. Minyanim, private prayer meetings in homes, were banned. No Hebrew bibles or prayer books had been published, since 1917.